With some modification it is possible to run many diesel engined vehicles on unrefined vegetable oil. The oil needs to be pre-heated, and well filtered before use to prevent coagulation. Biodiesel is the name given to any diesel equivalent biofuel which can be used in an unmodified diesel engined vehicle. In general biodiesel is most commonly made with a mixture of vegetable oil and methanol. With a flash point of 160 degrees C it is classified as non-flammable, and it is also biodegradable and non-toxic. On its own biodiesel has much lower emissions than petrodiesel, and it can also be mixed with petrodiesel to reduce emissions. B20 for example is a fuel containing 20% biodiesel and 80% petrodiesel. Pure biodiesel is B100. Biodiesel reduces carbon dioxide emissions by 78%, and carbon monoxide emissions by 50%. It also completely eliminates sulphur emissions. 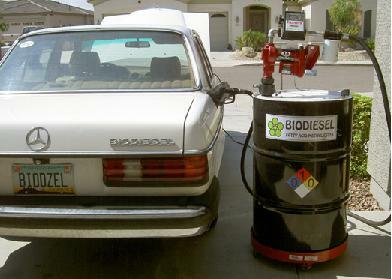 For vehicles made before the early 1990’s there is a problem with the use of biodiesel. The rubber hoses and gaskets used before that time can degrade in the presence of biodiesel. Newer cars have synthetic hoses and gaskets, and of course older cars can have their hoses and gaskets replaced before biodiesel is introduced. Biodiesel is also more solvent than petrodiesel and so it will rapidly break down any deposits of old residue in a vehicle’s fuel lines and fuel tank and clog the fuel filter. Therefore, after making the transition to biodiesel it is important to change the fuel filter around 1000 miles after switching.